In general, "auto-complete" means that when you are typing something, only need to type a little characters even without typing, the balance data will show or be filled automatically. For example, in MS Word, after you typed "2016-", it will show "2016-09-21" (for today) and prompt you pressing <Enter> to insert it (current date). Why need auto-complete function in our sending scheduled eMail program? Save your time – typing less and getting more. Avoid the mistake -keep a standard typing. Where can I enjoy the auto-complete feature and how to use in our sending scheduled eMail program? 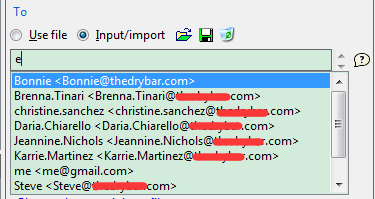 When you typing in the first [Display name] and [eMail address] fields, our sending automated emails programs will fill other [Display name] and [eMail address] fields as the save vales. Because in most cases, you will use the same display name and email address for authentication, sender, reply receiver and read receipt receiver. Screenshot 1: how to schedule emails? 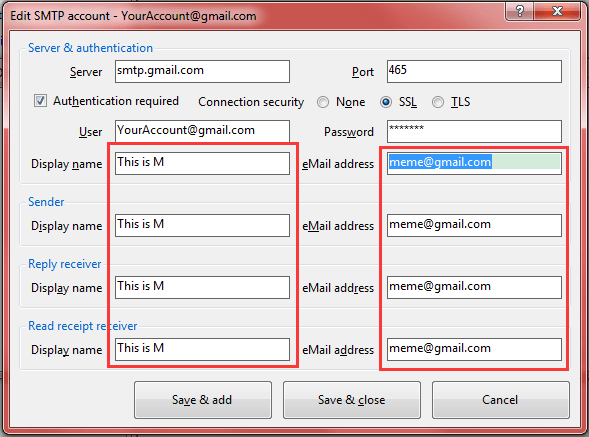 Create your SMTP account first. If you want to use the different ones, just change them on the corresponding fields. When you typing in the To/CC/BCC fields under “Input/Import” mode, our sending automated emails applications will prompt you the matching recipients which have been used or saved already. Screenshot 2: how to schedule emails? Create your email template first. When you see the drop-down list, just use <Up/Down> arrow keys to select your want, and the press <Enter> to fill it in the text box. Or just simply click the right one, also works fine. Download Our Sending Automated eMails Software to Know How to Schedule Emails!